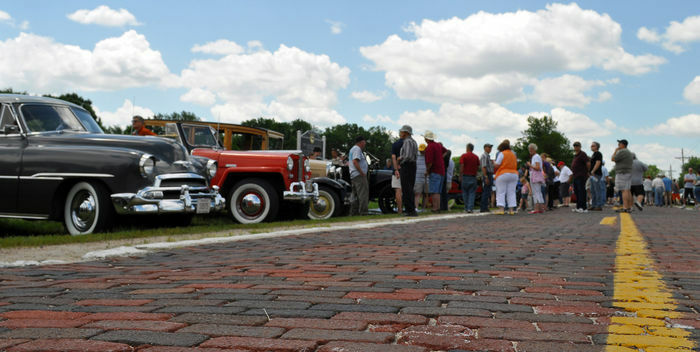 This three-mile brick segment of roadway was once the route of the Lincoln Highway. The Lincoln Highway Association was founded by private interests in 1913 to develop a paved, toll-free, transcontinental highway from New York City to San Francisco. Its work was part of a national movement to improve the nation's highway system, then in its infancy. This section of the Lincoln Highway, mapped in 1913 to connect Omaha and Elkhorn, was originally unpaved. In 1920, as part of a broader initiative to improve the entire highway across the state, it was paved using concrete underlayment with brick surfacing providing two, eight-foot lanes. In 1930 the official route of the Lincoln Highway (now U.S. 30) was relocated to provide a shorter route from a new Missouri River toll bridge at Blair to Fremont, bypassing this segment, which continued to serve local traffic. This well preserved example of early twentieth-century road construction reflects the importance of the Lincoln Highway and its role in promoting today's modern highway system. It is listed in the National Register of Historic Places. “Lincoln Highway at Elkhorn,” Explore Nebraska History, accessed April 18, 2019, https://mynehistory.com/items/show/119.